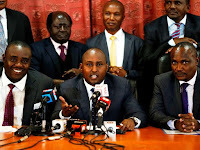 Friday December 28, 2018 - A section of Orange Democratic Movement (ODM) leaders have accused Deputy President William Ruto of trying to undermine President Uhuru Kenyatta and their party boss. Raila Odinga’s March 9th peace deal. The leaders led by ODM's Director of Elections and Suna East MP, Junet Mohamed, said Ruto was not sincere in his support for the handshake after his lieutenants sensationally claimed that Mr Odinga was using it as a launching pad for his 2022 presidential bid. Junet accused the DP of “speaking from both sides of the mouth” on the matter as he plays politics. “Ruto was in Kisumu barely two weeks ago and he said proudly that he is supporting the handshake. He even gave a narrative that when you see Tinga (Raila) on the right side, and Uhuru on the left side, he is in the middle.” Junet said. “Today they are saying Raila is using the handshake to propel himself to the presidency. Nothing can be further from the truth,” Junet added. zombie, the guy is retarded when he talks and is so boring. He can be president of only Kisumu and orange house and that's it!